‘Tis the season for family, friends, fun, and . . . food poisoning (ewww). For some unfortunate merrymakers, holiday feasts will start in the dining room and end in the bathroom. In fact, the Centers for Disease Control and Prevention estimate that every year, more than 76 million people fall victim to a foodborne illness. For those of us who are designated holiday chefs, meal preparation can be tricky; many of us are preparing dishes we don’t usually cook and for large numbers of people. And it doesn’t help that at many celebrations, different types of foods may be left out for extended periods of time or not stored properly. This can allow harmful bacteria to grow. As many ways as there are to prepare beef, lamb, poultry, and other kinds of meat, there are just as many varieties of bacteria that can cause infection if food is not cooked thoroughly. Meat can harbor bacteria such as Salmonella, Campylobacter and Staphylococcus aureus, more commonly known as staph. Staph is often found on people’s skin, finger nails and noses, which can contaminate food they prepare. The bacteria can grow on the food and excrete Staphylococcal enterotoxin B, a common cause of food poisoning. Symptoms—such as vomiting, diarrhea, nausea, and abdominal cramps—usually develop within one to eight hours after eating contaminated food and can last one to two days, long enough to ruin any holiday break. Creamy potato salad is a delicious complement to any main course, but that doesn’t mean its potential for food poisoning is any less than an entrée’s. In addition to staph, there have been reports of food-borne illness from potato salad contaminated with Shigella bacteria. 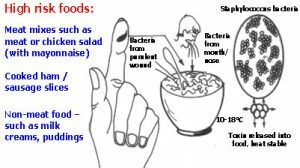 If someone has the bacteria on their hands and doesn’t wash them before handling food or drinks, Shigella can find its way into dishes like potato salad, where it can multiply at room temperature. 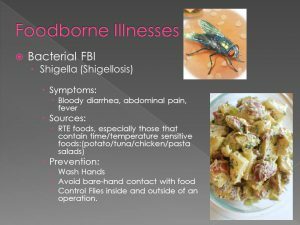 Anywhere from one to seven days after eating food contaminated with Shigella, diners may experience abdominal cramps, diarrhea, fever, vomiting, or blood, pus or mucus in stool. Think your stomach is safe if you don’t cook? Think again. If your holiday traditions include takeout, watch out for leftover fried rice. 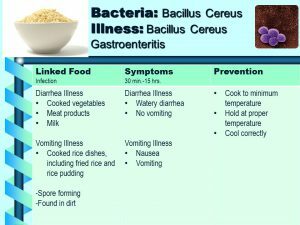 Uncooked rice can contain spores of Bacillus cereus, bacteria that can survive on grains of rice even after they’re cooked. When left at room temperature for extended periods of time, the bacteria can multiply, potentially causing vomiting and diarrhea. 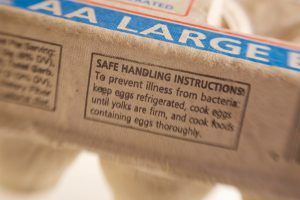 Raw or undercooked eggs can also be a breeding ground for Salmonella, Campylobacter and staph. Salmonella is found in the intestinal tracts of animals, and when infected feces contaminate improperly prepared food, the bacteria can be transmitted to humans. Symptoms commonly appear eight to 12 hours after eating. To avoid diarrhea, fever, abdominal cramps, and vomiting, think twice before dipping a spoon or finger into cookie dough, brownie batter or anything else containing uncooked eggs. When in doubt, throw it out, especially when dealing with meat, poultry and dairy. For more information on food safety and other Holiday topics from the IPC, please click here. From the IPC family to yours, best wishes for a wonderful, happy and safe holiday season!